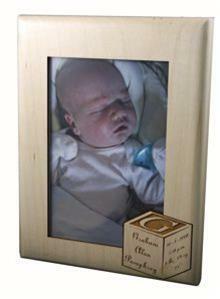 This Personalized Baby Block Picture frame is the perfect gift to celebrate birth or adoption. New parents, grandparents, aunt and uncles will be thrilled to open this unique gift. Proudly display your 4x6 photo in this solid maple frame – personalized with baby’s name and birth stats. This photo frame is sure to bring a smile to your face every time you look at it and remember the day you brought your baby home. Frame includes glass. An easel back for sitting on display. A keyhole for hanging on the wall. Each Frame is Personalized with the following information: Baby's Full Name, First Initial, Baby's Date, Time, Weight and Length at birth. Frame can be personalized on the back with "A Special Gift From" just like our blocks. Frame can be ordered in Portrait or Landscape mode.